In small bowl, mix mayonnaise, roasted peppers, garlic and paprika. Cover; refrigerate until serving time. In large bowl, mix turkey and tapenade (do not overmix). Shape mixture into 4 patties, about 1/2 inch thick. In 12-inch skillet, heat oil over medium-high heat. Cook patties in oil 12 to 14 minutes, turning once, until thermometer inserted in center of patties reads 165°F. On each bun bottom, spread 1 tablespoon mayonnaise mixture; top with lettuce, cucumber slices and burgers. Spoon remaining mayonnaise mixture over burgers; top with cheese. Cover with bun tops. 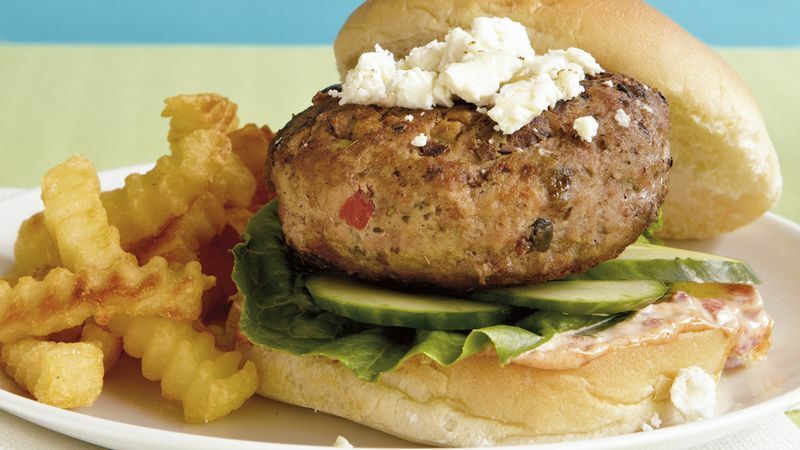 To add color and an extra punch of flavor, top burgers with roasted red bell pepper slices before topping with the feta.